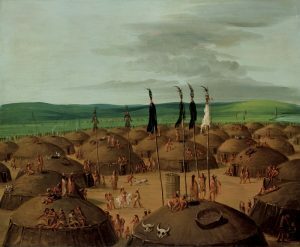 Around 1500 AD, Mandan women began to build round houses, or lodges, instead of rectangular ones. They also started using bison skin tipis when they were travelling or hunting. By the 1600s, the Mandan were probably already catching European diseases like measles and smallpox from their Sioux and Mississippian neighbors, even though they hadn’t met any Europeans yet. Then about 1750, about the same time as the Sioux, the Mandan were able to buy horses from the Apache to their south. The Mandan used the horses to hunt more bison than before. The arrival of the Sioux in the Dakotas may have once again pushed the Mandan further west, this time on to the Great Plains. About the same time, the Mandan met Spanish explorers coming from the south-west and French explorers coming from the north-east. The Mandan bought beaver pelts, bison hides, and other furs from the Shoshone and Cheyenne to their west. They sold the furs to French and Spanish traders for guns and horses and iron tools and cloth. That’s how the Shoshone woman Sacagawea and her husband, the French trader Toussaint Charboneau, came to be living with the Mandan. When Lewis and Clark came by in 1804, the Mandan considered them to be more traders. So the Mandan let Lewis and Clark stay the winter with them. Then Lewis and Clark hired Sacagawea and her husband as guides. On their way back, Lewis and Clark brought the Mandan chief, Sheheke, to introduce to the United States President Thomas Jefferson. Sheheke had a good time meeting Jefferson, but it took three years for him to get home! The Sioux and Arikara people were enemies of the United States and the Mandan and didn’t want to let Sheheke through. In the end, the United States didn’t conquer the Mandan. That’s because by the late 1800s, most of the Mandan had already died of smallpox. The few surviving Mandan built log cabins, like the Europeans around them, instead of their earth lodges. The United States government took over the Dakotas little by little, gradually taking more and more Mandan land. In 1870, the United States declared 8 million acres of Mandan land to be their reservation. But by 1910, the Mandan reservation was only a tenth as big as it had been in 1870. In 1951, the United States Army built a big hydro-electric dam on the Missouri River that flooded about a quarter of the Mandan reservation, including most of the good farmland. Today, many Mandan operate a casino on their reservation. Cite this page: Carr, K.E. 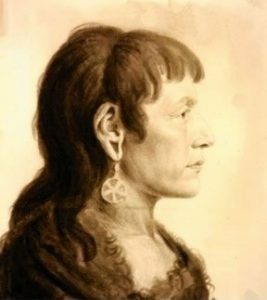 Mandan and Sacagawea – American history. Quatr.us Study Guides, August 13, 2017. Web. April 25, 2019.